None planned at present, but we’ll let you know! 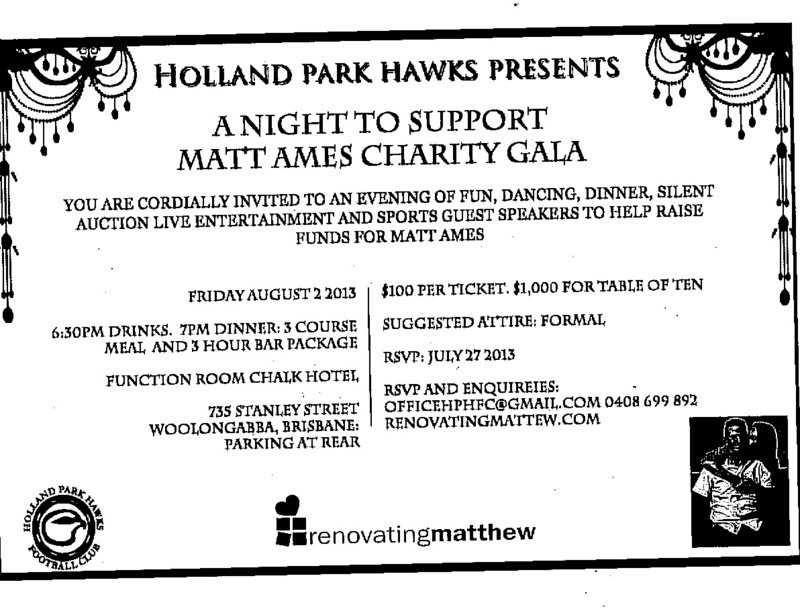 February 27 2013 (Brisbane): Renovating Matthew Theatre Night (Clink on link for PDF). Celebrated the launch of the Renovating Matthew Foundation with champagne, nibbles, and a showing of Lincoln. A great time was had by all! ST THOMAS MASQUERADE GALA – 24 AUGUST 2013: The school community kindly arranged for proceeds from the upcoming Masquerade Gala to go to the Renovating Matthew Foundation. This was a fabulous evening surrounded by friends and the opportunity to hear Matthew tell his story. RENOVATING MATTHEW BALL – 6 SEPTEMBER 2013: The Environment Institute of Australia and New Zealand and ‘a crew’ from Origin Energy, URS and various friends and family hosted a ball in Matthew’s honour on 6 September at the Sofitel Hotel Brisbane to raise funds for Matthew’s prosthetics. HOLLAND PARK HAWKS CHARITY GALA – 2 AUGUST 2013: Held at the Chalk Hotel, Woolloongabba. A fantastic night was had by all. See here for some pictures! Hi there..I just read Matthew’s story and I am deeply touched by his bravery determination and warrior spirit. I couldn’t help but send his inspiring story to The Ellen Show as I know Ellen is coming to Australia in a few days. I encourage you to send it as well here is the link http://www.ellentv.com/be-on-the-show/ I have also shared his story on our Facebook page after Caitlin shared it with us. We wish Matthew all the very best. Really all the very best. May everything he needs be provided and we hope from the bottom of our hearts that Ellen DeGeneres reads Matthew’s story. I read your story in the Courier Mail this morning. There was chaos at home with three children under 7 charging around me whilst I read but nothing could tear my eyes from the pages. Your family is remarkable, brave and clearly a very solid family unit. I couldn’t possibly imagine what going through this would be like but I wanted to say I truly admire you all. I will be watching Matthew’s inevitable progress with great interest. Thank you for sharing your story. I met a very nice girl at the park I work at today who told me about Matt’s story. She was hiking from Kingston to Ottawa on the trans canada trail in hopes of raising money. I hope my donation to Matt will help. It’s not alot but it’s all I had. One touching story, thank-you for sharing it with us, a truly amazing man and an incredible family full of love and faith.. I am proud to donate, and look forward to hearing about their future journey. What a story, Matt may have no arms and legs but he has great big heart, and what a wife she is amazing, his rock and strength they have a love so deep it shows. Our thoughts and prayers are with you and your family. Matthew & Diane, I am in love with YOUR LOVE STORY! So, so special you & your family are. Wishing you all the very, very best. Been thinking about your story since last night. Inspiration to all of us. They should have permanent billboards to remind us all of your strength and true love. Susan Wow Wow Wow may we never complain again, remarkable man, wife and children, I pray you will one day wear your wedding ring and hug your beautiful family, can’t stop crying and thinking what an amazing person you are. All the best c’mon WA lets get behind this man with some fundraising and donations. If I could go back to Year 7 and do my speech about overcoming adversity, I would talk about you Matthew 🙂 All the best of luck for the future, you deserve only the best.